Monday mornings aren’t so bad if you are me! While most of you dread Monday’s, I actually look forward to them. I know you probably think I am a nutcase but really take a peek into my day. I start my day as early as 6 AM and as late as 8 AM depending on how late I stayed up to watch The Walking Dead. The first thing I do is open as blinds as possible. I LOVE sunshine and it makes my depression not so bad. I open the front and back doors to the security screen doors. I love fresh air in my home especially with three animals! If I am up early I get to help my 13 year old get off to school and wish my boyfriend a great day at work. If I wait until later to rise I have to make sure the animals are fed and go outside. I then get settled on the couch with a cup of coffee and my computer. I turn on the television to The Today Show. My yorkie settles in on the couch next to me on a fuzzy blanket. I follow up The Today Show with Wendy Williams and then possibly some HGTV. 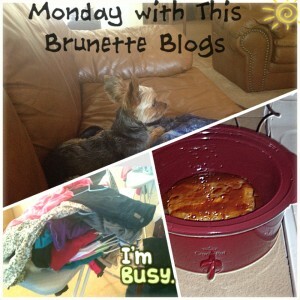 Monday is my time to focus on improving my blog. It is the day that I get, for the most part, uninterrupted time to really brainstorm ideas and put pen to paper. Mondays are also when I get to catch up on my housework. I still haven’t finished the mountain of laundry I need to do or cleaned the kitchen from dinner last night. The two week old pile of pet hair on my carpet still needs to be vacuumed. Oh yeah, I still have about 30 articles of clothing to iron today, otherwise it won’t get done until possibly next weekend. Hooray for me though! I was able to get a pork loin in the crock pot by 12 today. I know the family will love pulled pork sandwiches for dinner tonight. Monday night will focus on some family time and finishing up my household duties. I hope to fit in a nap before I have to get to work at midnight. What does your Monday consist of? How do you make your Monday marvelous?